The new XCOM board game sounds phenomenal, but last month I played a different kind of XCOM board game. 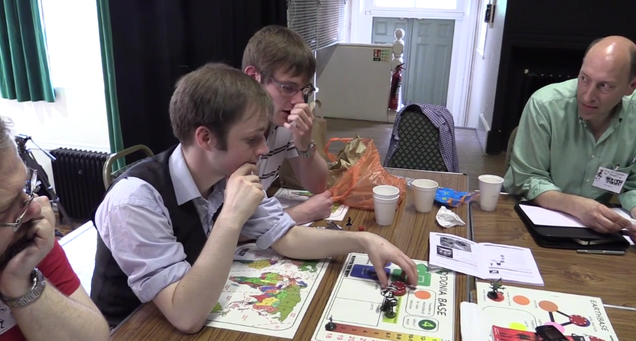 Watch the Skies was a day-long game run by the UK Society of Megagame Makers. "Megagame" is a name that doesn't disappoint—each one features dozens of players controlling small parts of a massive story. My friends and I controlled the nation of Japan during an alien invasion. More teams of players controlled China, America, Russia, the UK, France and the USA while another 12 players controlled the aliens, and a final player representing the world media wrote an hourly mini-newspaper. It was a fascinating day that we documented in this video, but it was especially cool for a die-hard XCOM player like me. Here are a few things that didn't shake down quite how I'm used to. I've got some bad news for you. What happens when UFOs are sighted in our skies isn't a surgical, measured response from an impartial strike team. What happens is the world's nations start beating the sky like the piñata at the end of the world. While no single nation had any idea what the aliens were here for, we knew they were in our airspace with technology that was light-years ahead of our own. All this was before we'd even recovered any tech. By the time the U.S.A. announced they'd patented the cure for cancer, the world had cut off all communications with them. This same technology came close to tearing whole teams apart. 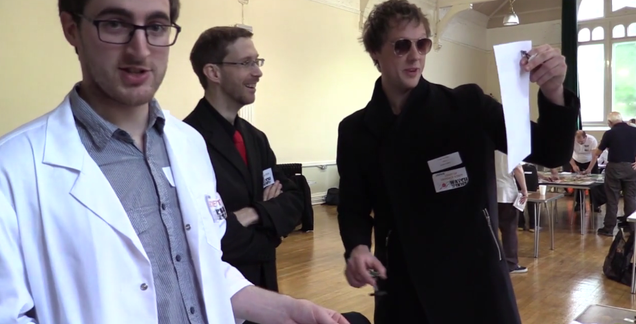 Two thirds of the way through our day-long game, our Prime Minister found out that our Head Scientist was angling our research not for military gain, but to secure multiple nobel prizes. Meanwhile, I was playing the head of the Japanese armed forces, and I can tell you that while all the grudges of human history really did fade away while the aliens were attacking, things became really rough when the aliens stopped again. The old grudges and border disputes came back, but this time the world's nations were armed with fantastic alien tech. What do you think happens when a UFO is sighted over a country without top-of-the-line anti-aircraft defenses? That's right! It becomes a horrible disc-shaped international incident as every nearby country sends strike teams to "help." The XCOM video games have always had your performance during missions affect how the world thinks of your organisation, which is an adorable and innocent way to look at job performance. Our game had our prime minister writing press releases on his Blackberry between missions. We meticulously timed our interviews with the world press so that we wouldn't lose the headline to something else. Countless millions were invested into pro-Japanese television advertising, and by the end of the game we were even running smear campaigns against the United States of America. This is the one feature I'd actually love to see in an XCOM game. Balancing access that the world press gets to your organisation with how brutal or respectful you are to the aliens, or even your own staff. It's a game all about securing funding, after all. This one came as a horrible shock. We expected the aliens to have anti-gravity technology, plasma rifles and cyborgs. We didn't expect them to mass-deliver psychotropic drugs on Moscow to make it SEEM like the city was under siege. Nor did we expect them to suddenly evacuate their secret bases in third-world countries when one of us invaded, turning it into an apocalyptic media disaster. But the absolute worst was when the aliens focused all of their resources into clandestine operations in impoverished South American countries, for years on end. Nobody could get the political support to invade somewhere so far away. Of course, it's all good if the aliens you get are terror-causing, gore-flecked pantomime villains. But what happens if they're just... weird? And can do a plausible impression of being peaceful? What if humanity's making the biggest mistake of its soon-to-be short-lived history in attacking them? One of the toughest turns in our game was when America began brokering deals with the aliens, and leaving them alone in response for far-future agricultural technology and all sorts of other goodies. It was a window that gave the aliens room to breathe and plan operations elsewhere, and only served to make the rest of the world angrier. You know what's worse than playing a video game for six hours and starting to make stupid decisions? Playing a game on your feet for six hours, with no lunch break, when you can launch your country's reserve of nukes with the right or wrong word. We should know. We built one. If you're considering investing your nation's R&D budget into dressing a guy up like Optimus Prime, you've probably already lost. As you'd imagine, aliens descending from the sky to perform random abductions spooked the world's populace, represented by a terror track. But what scared us as players was, in fact, the looming possibility of a nuclear strike. Or, even worse, the possibility of the aliens responding with equal force. "Why not just nuke the alien base?" is an option that the plot of XCOM is forever sidestepping, and we found ourselves sidestepping it in our panic, too, but for different reasons. A nuclear exchange could have broken down the world's governments, a fate far worse than our loose scrapping with our interstellar interlopers. But once Russia located an alien moon base, and America swore to protect the aliens, nukes were all anybody could talk about. Because, seriously, this was amazing. Players from different countries were free to wander over to one another's tables, but there were too many people and too much to discuss, so the hourly newspaper became our source of in-game news. Which was absurd, because the thing had more spin than a yo-yo. But that's just the start. I still laugh when I remember our Prime Minister getting cornered for an interview about Iran when I hadn't finished briefing him ("We have... we'll absolutely be having a strong... policy.") I love that our Scientist began leaking info about his rivals' projects to the press. But most of all, it's great to see games not only play with the truth of a given situation, but to put another player in control of that truth. 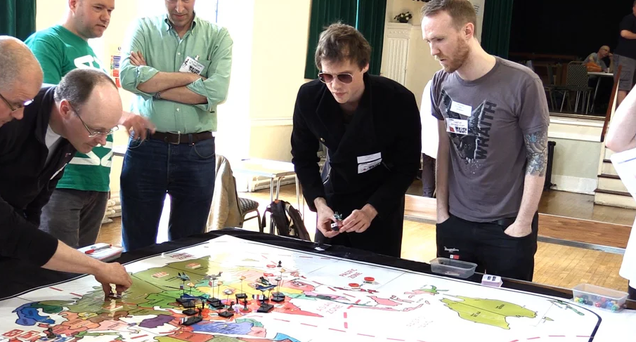 If you're at all interested in the work the UK Megagame Makers do you'll find their site right here (together with downloads for some of their games), though recently their work has been reaching other countries. 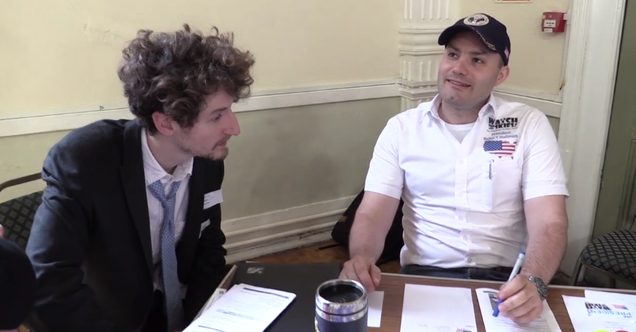 The recently-opened New York City Megagame Twitter is right here. Quintin Smith is a games columnist able to identify different board game manufacturers by their scent. He is not proud of this. He's part of a team working to make a home for play in Shut Up & Sit Down, and is @quinns108 on Twitter.